What term do you use for a carbonated soft drink? Since I don't drink any, and only buy it for parties, I say "soda pop." Others around me call it pop. What you call these drinks mostly depends on where you are from. 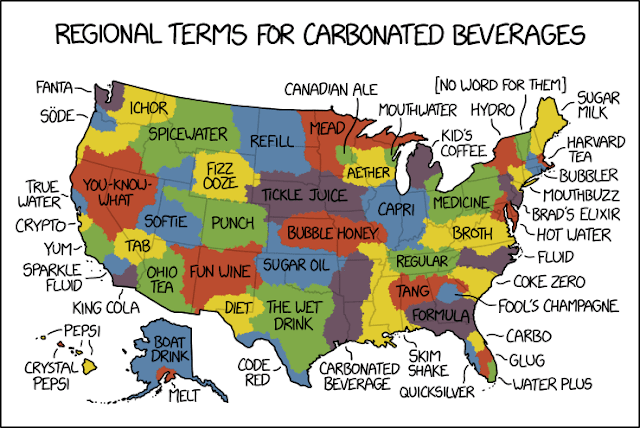 However, when people say "pop" in a soda state or vice versa, everyone knows what they mean. Then there are people who ask for a Coke and then have to specify which kind. Go figure. Conde Nast talked to people from all 50 states about which term they use. Randall Munroe at xkcd responded to this with a map with much more detail on the terms used in different areas of the US.